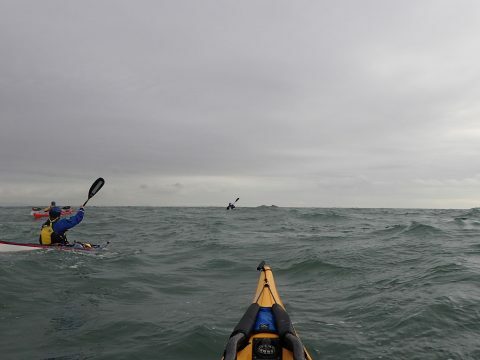 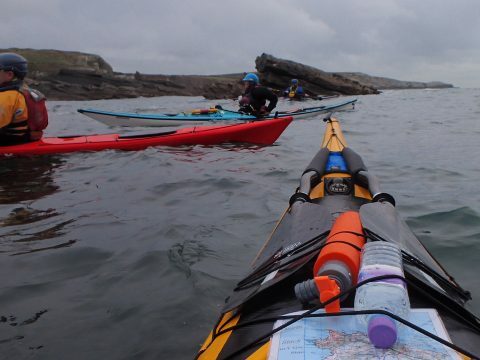 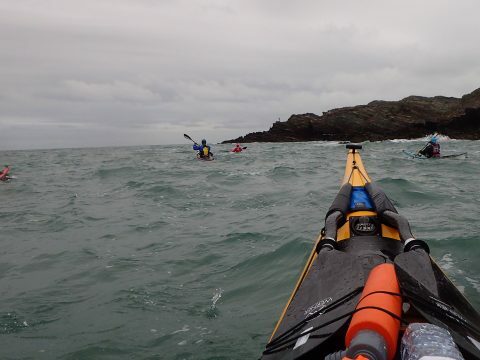 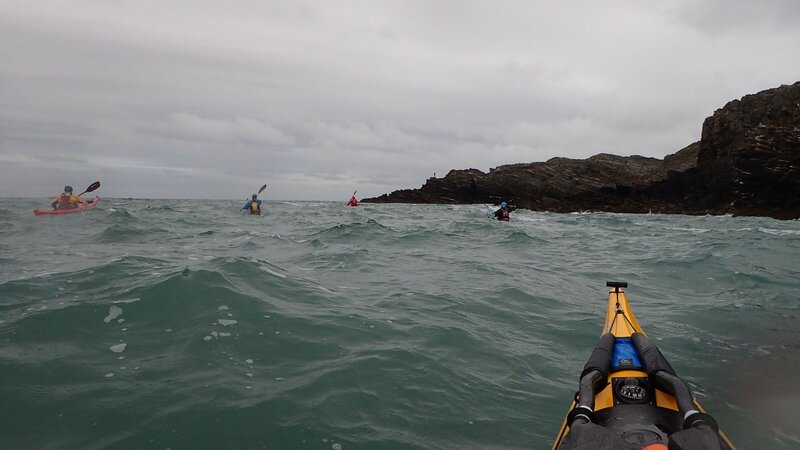 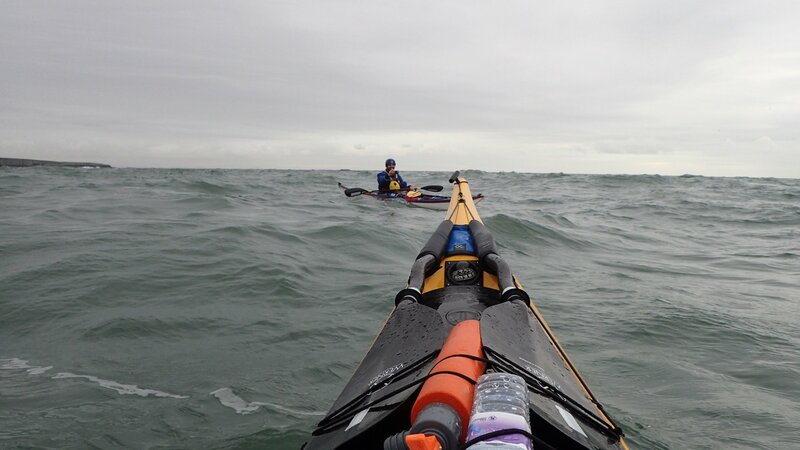 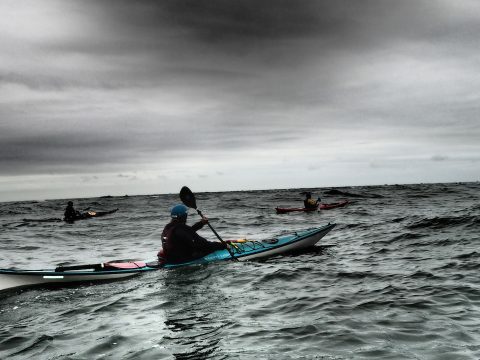 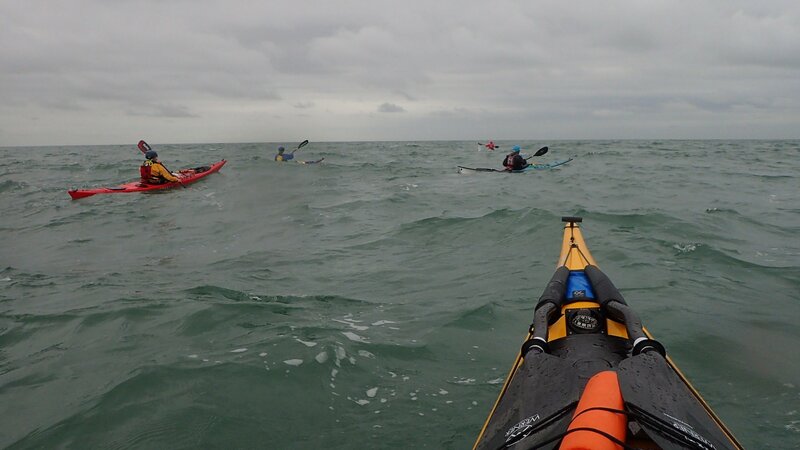 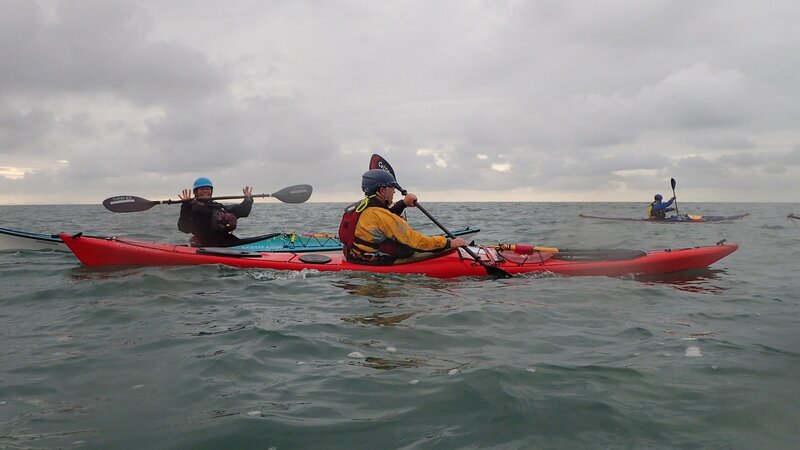 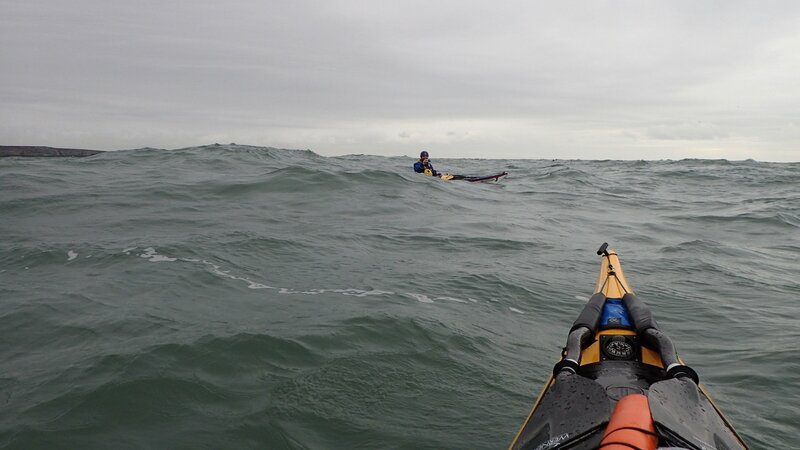 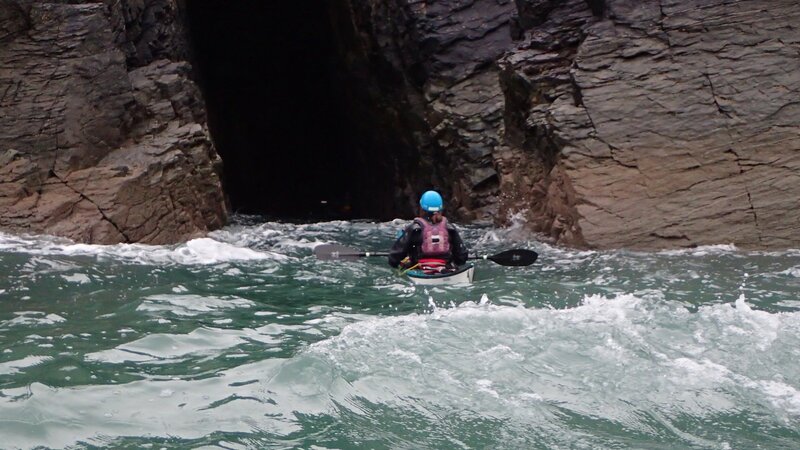 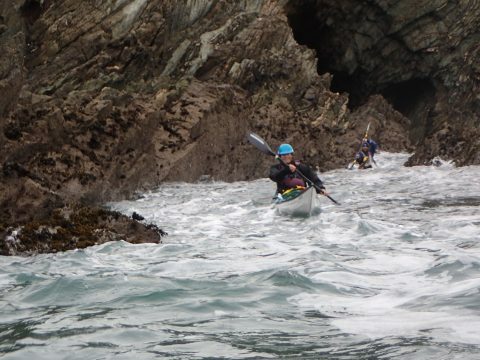 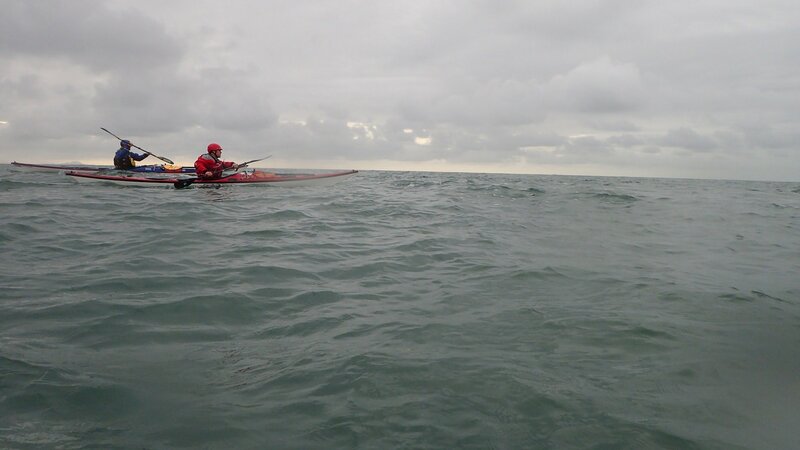 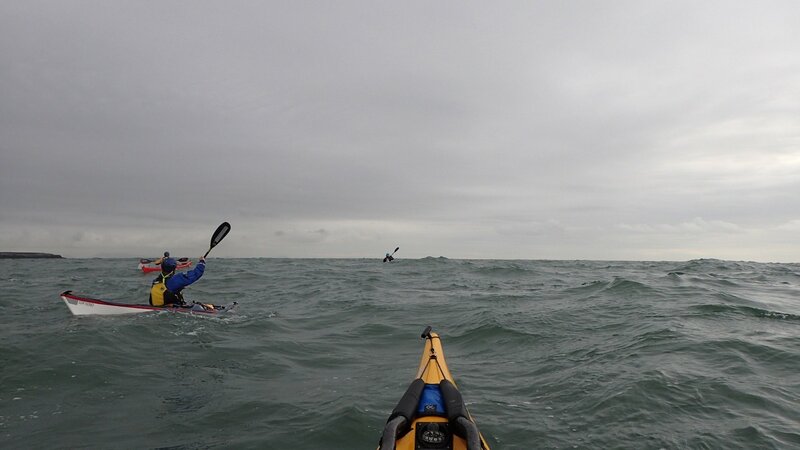 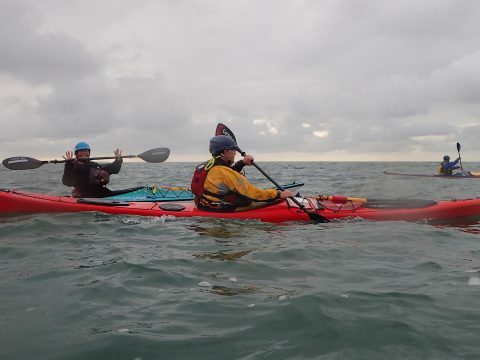 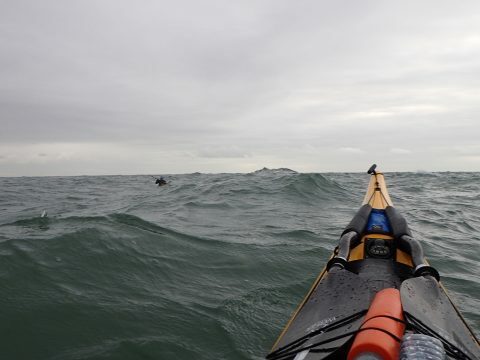 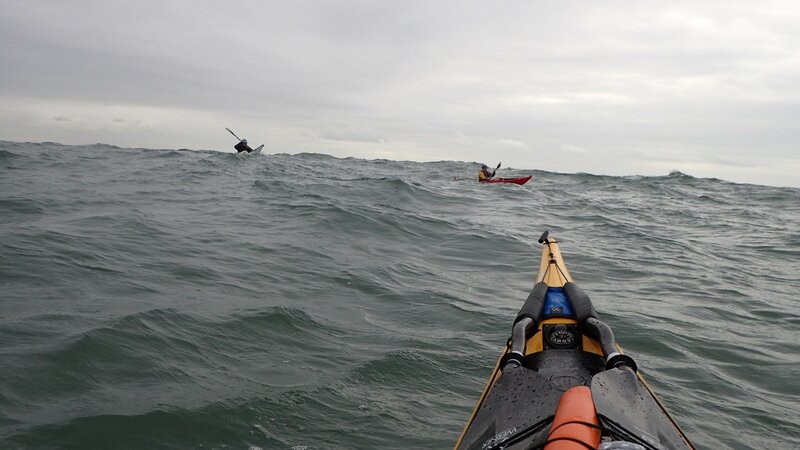 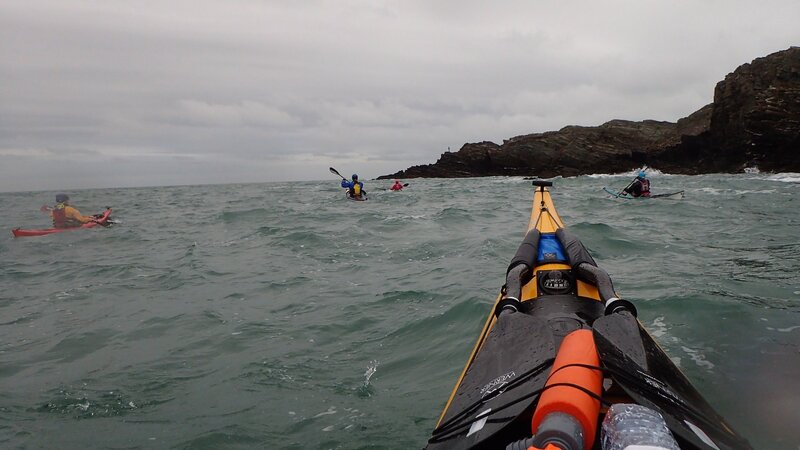 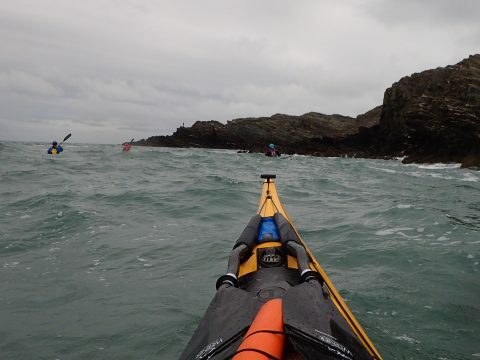 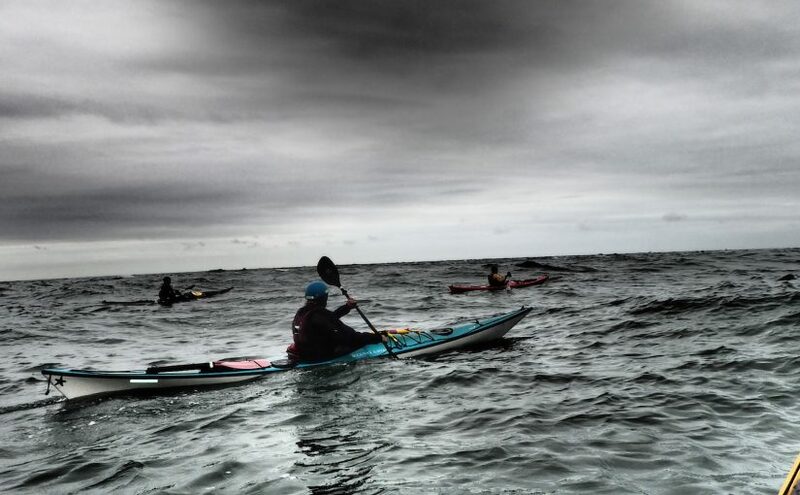 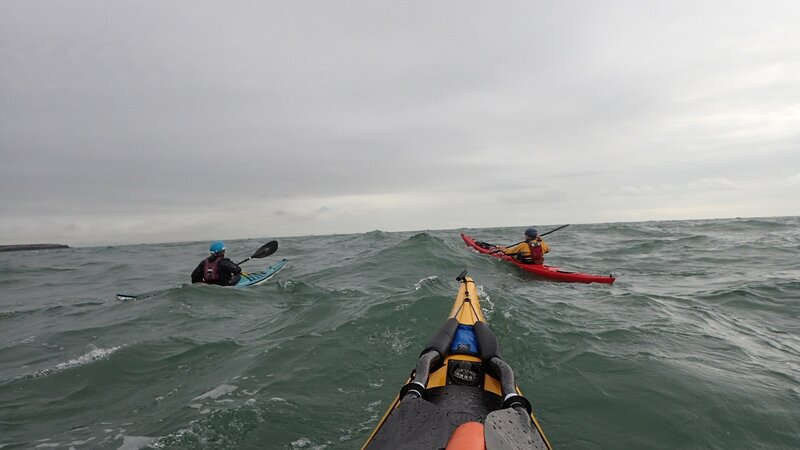 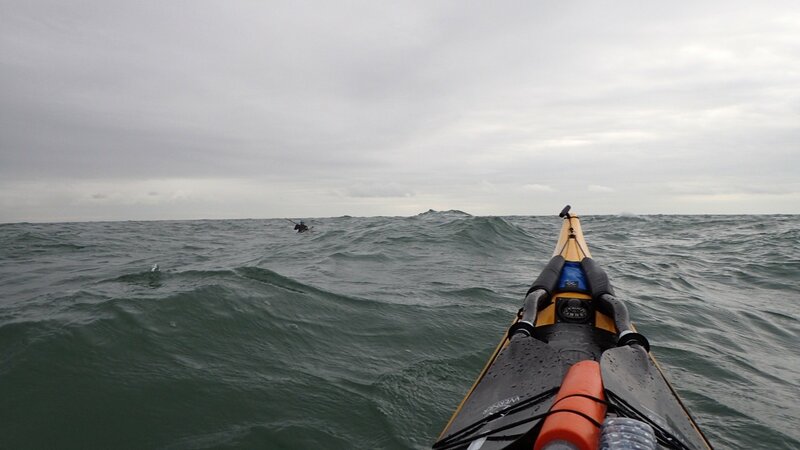 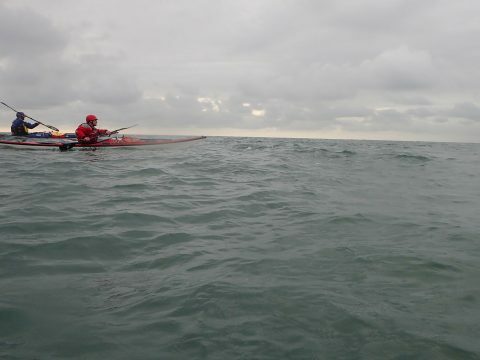 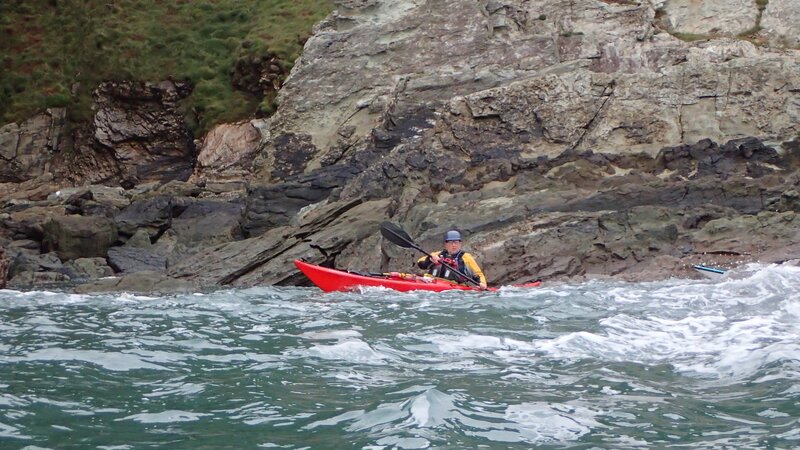 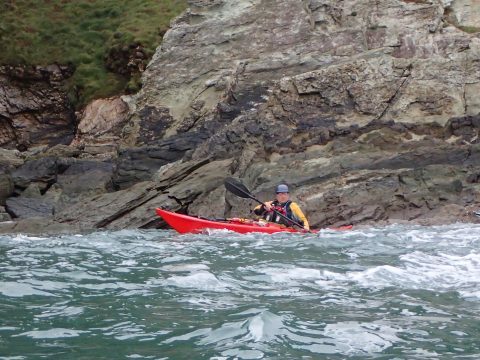 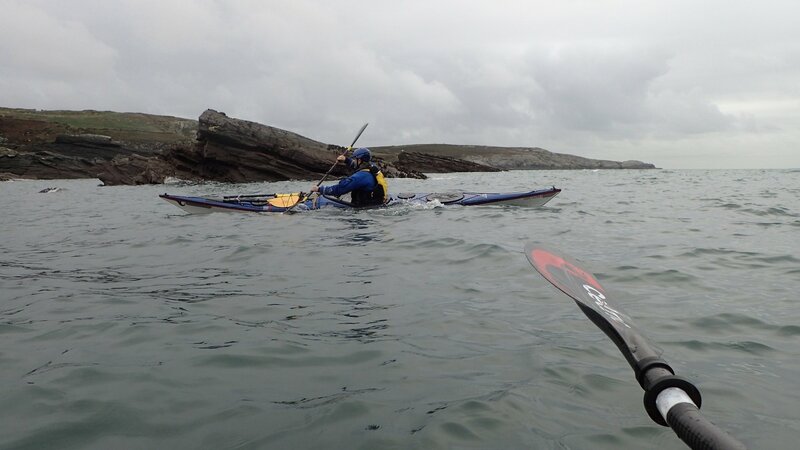 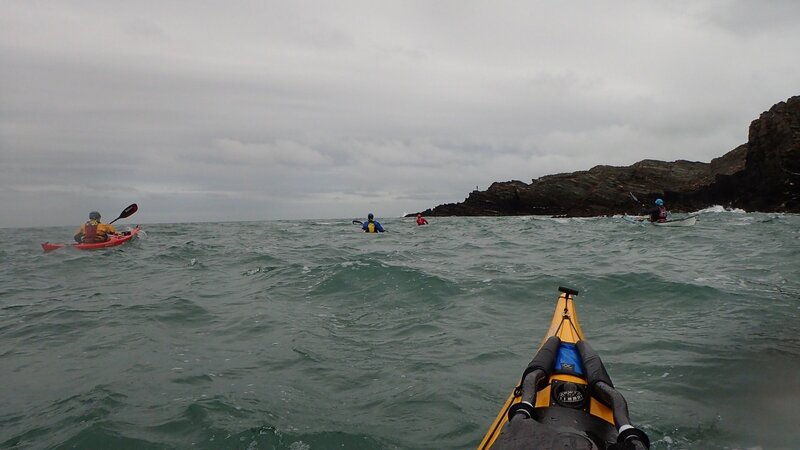 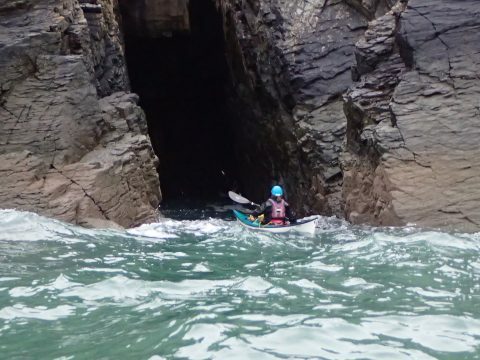 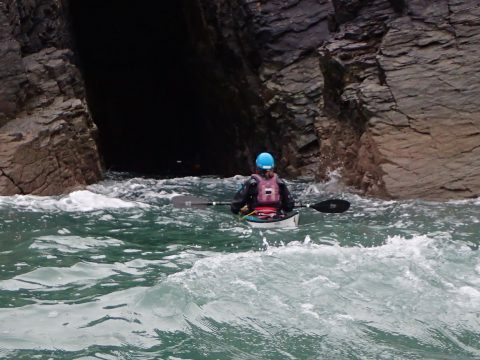 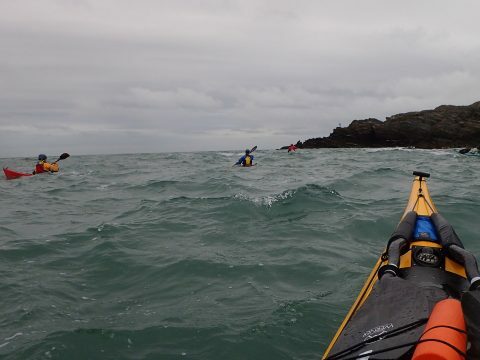 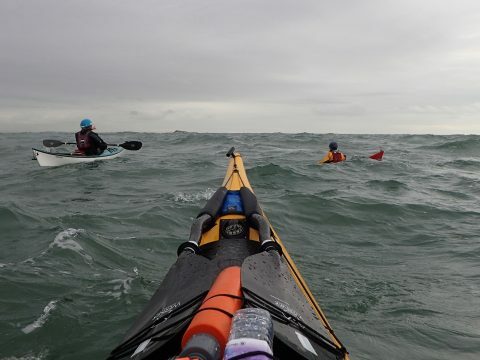 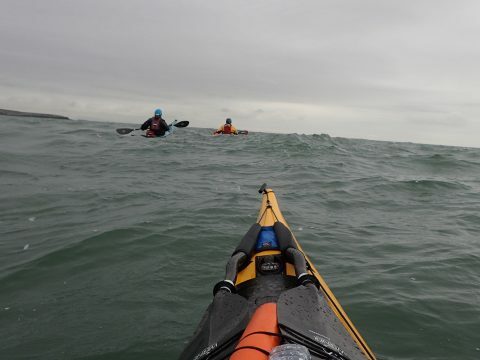 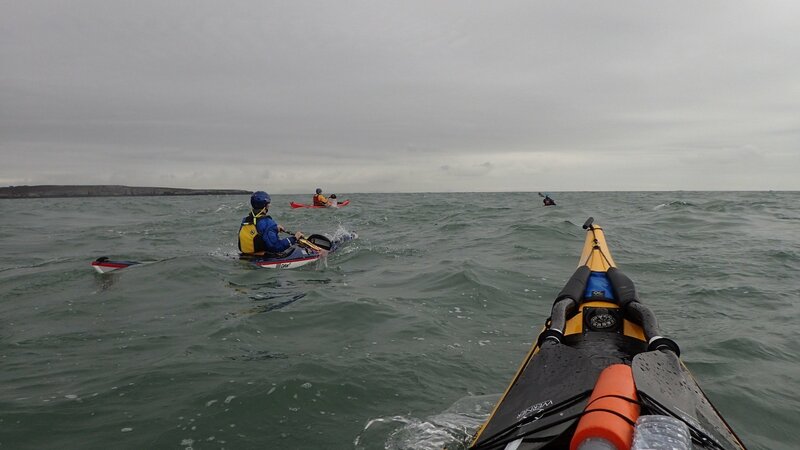 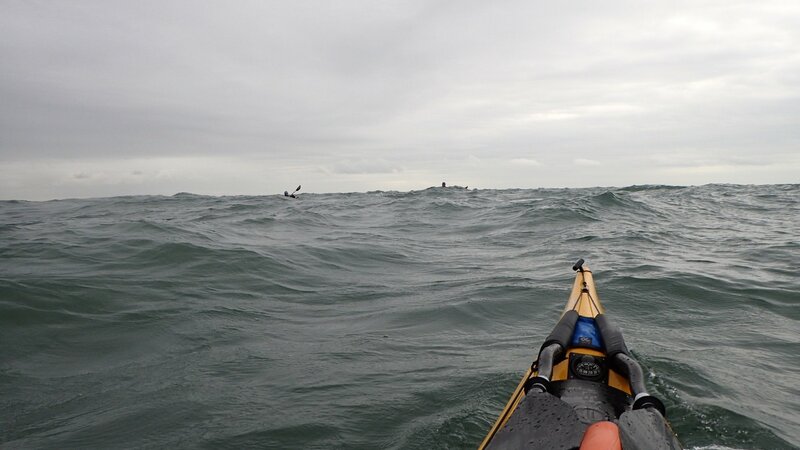 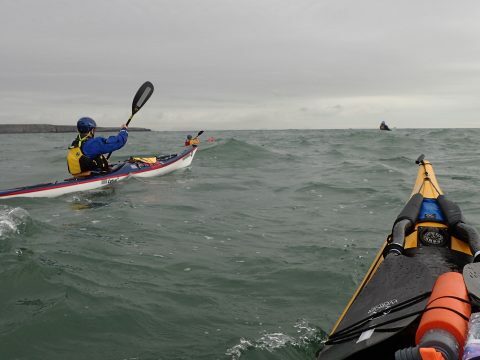 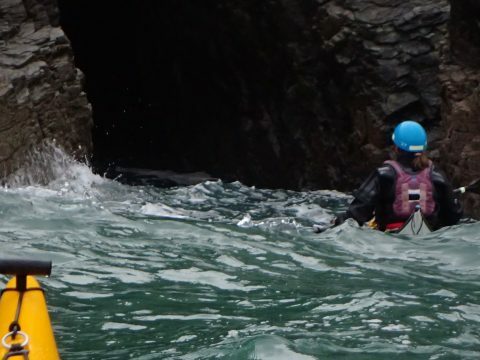 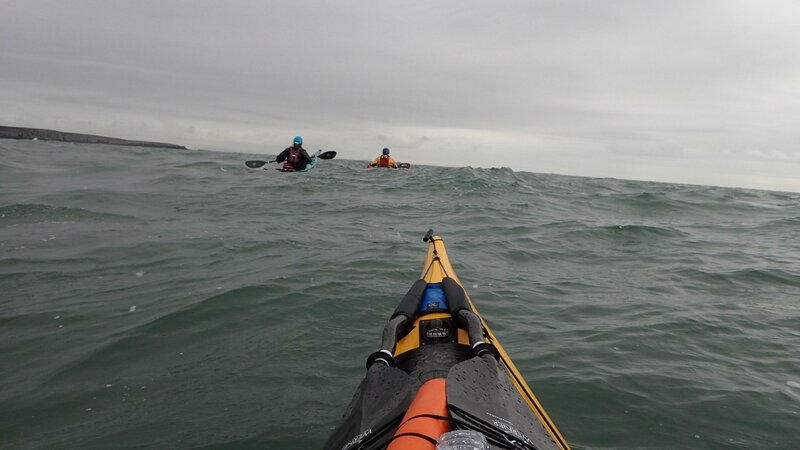 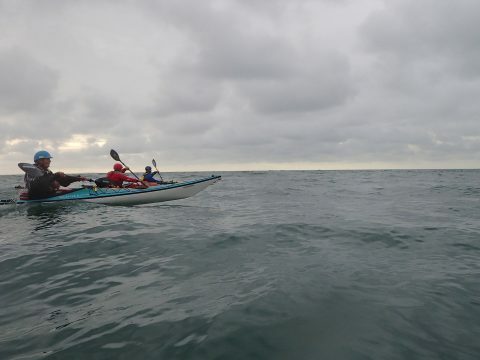 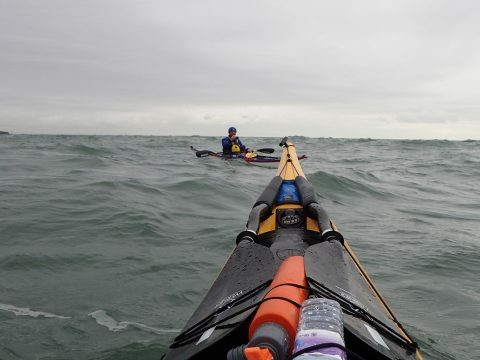 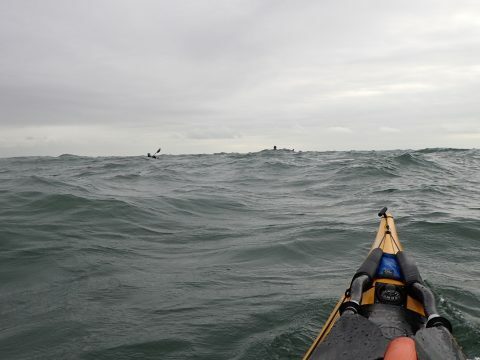 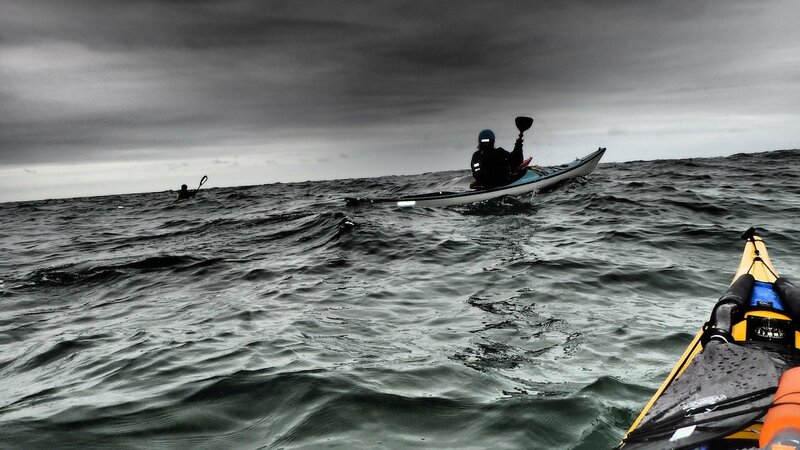 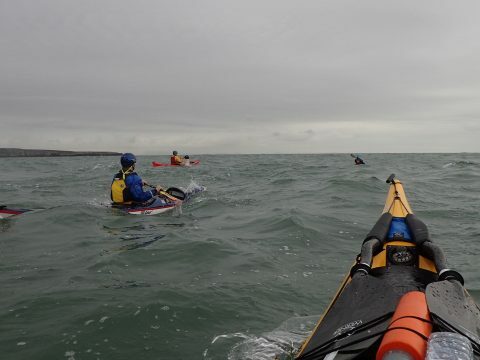 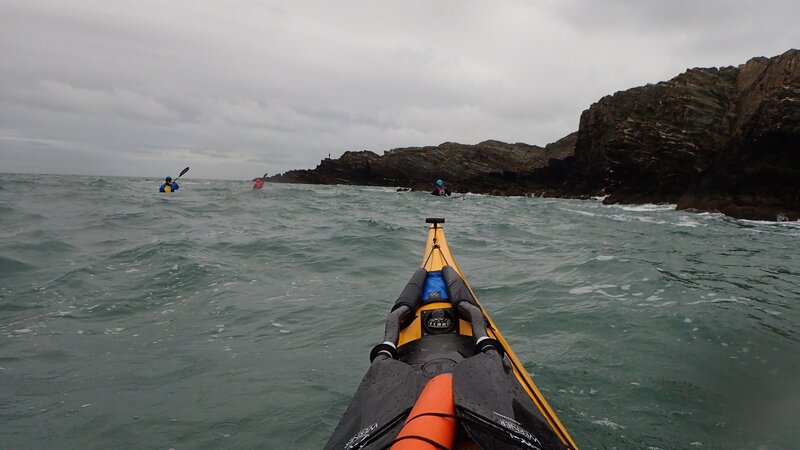 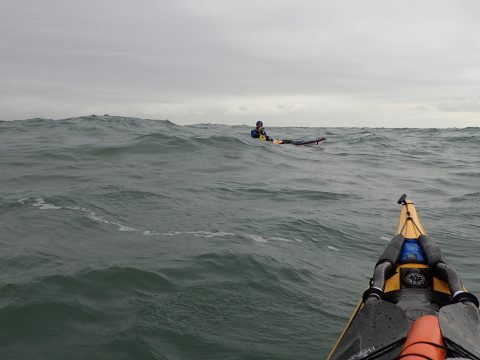 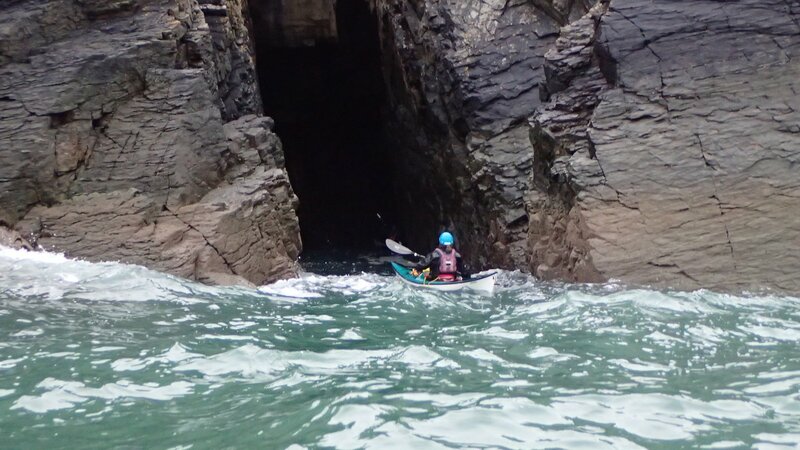 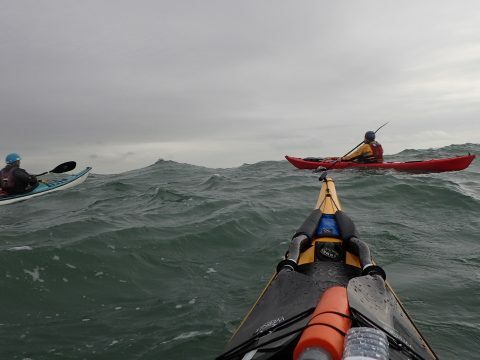 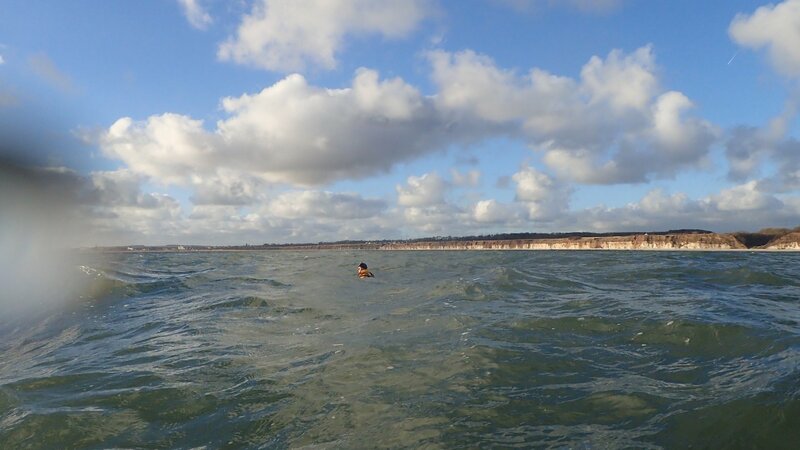 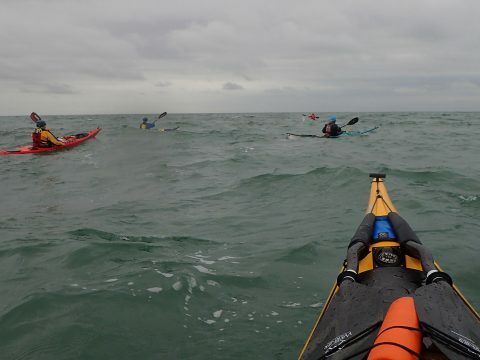 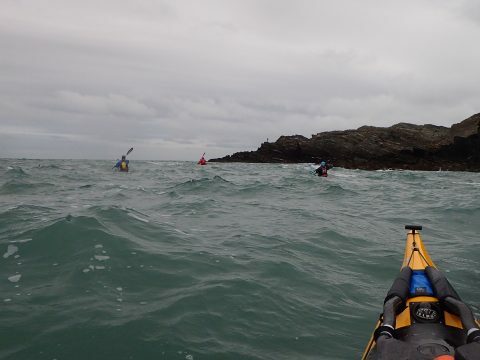 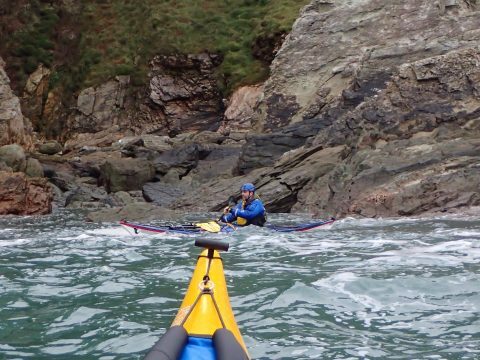 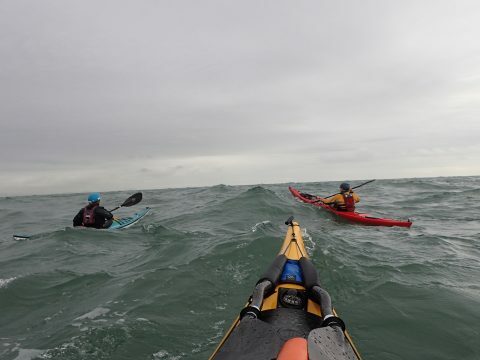 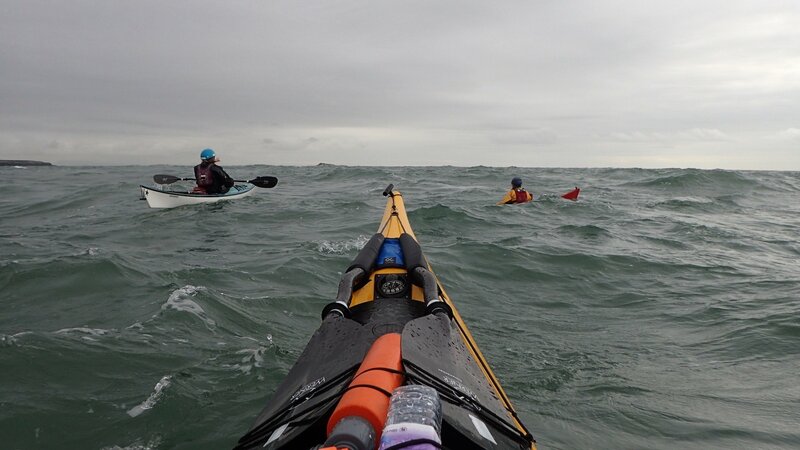 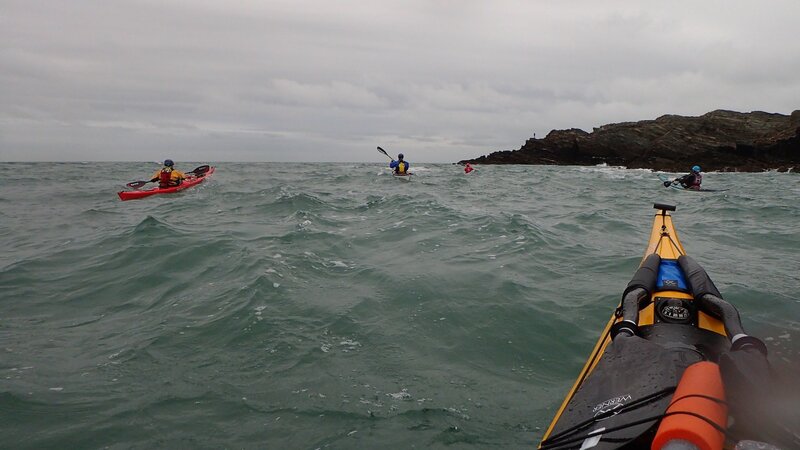 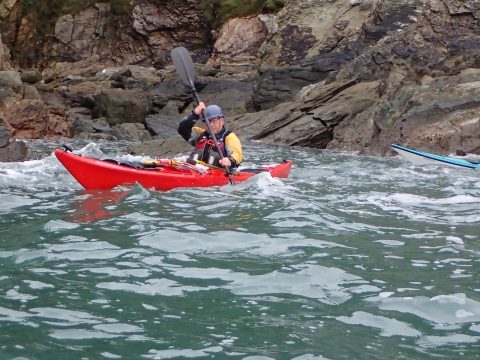 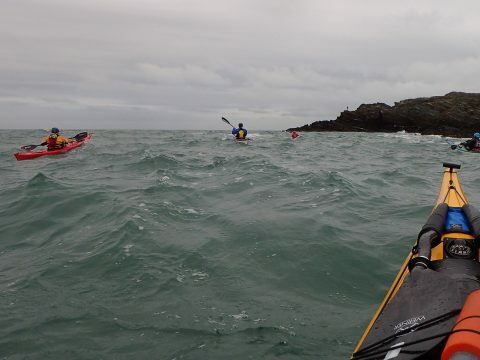 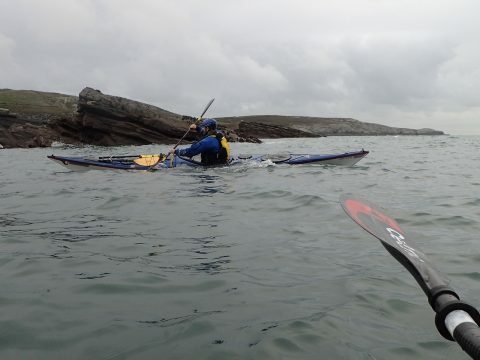 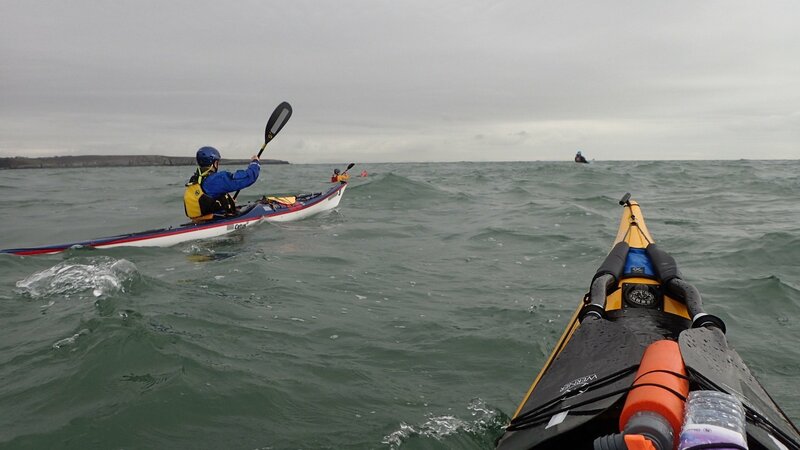 On day 2 of the NWSK end of Season meet, I decided I fancied some more lumpy seas to play in so I paddled with Sue’s group, which consisted of Graham Cooke, Alan Tonge, and Alan. 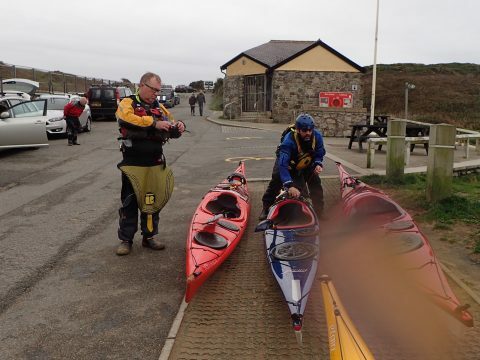 We messed about in Penrhyn Mawr for a bit before setting off for lunch stop in Abraham’s Bosom. 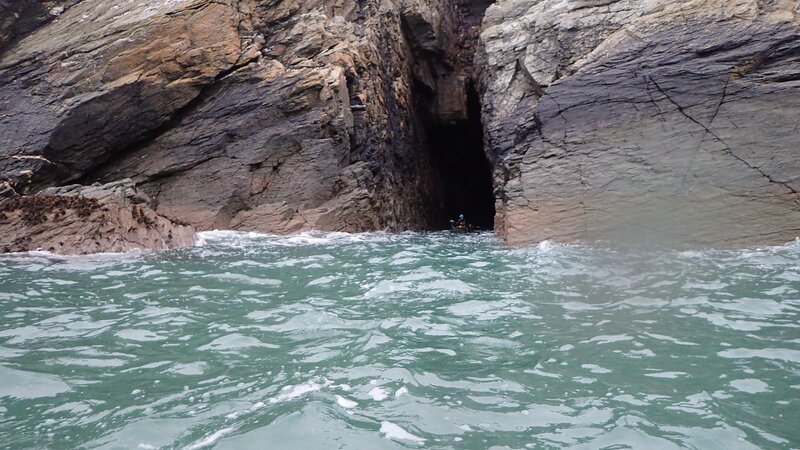 It was then on to South Stack with lots of rock hopping along the way. 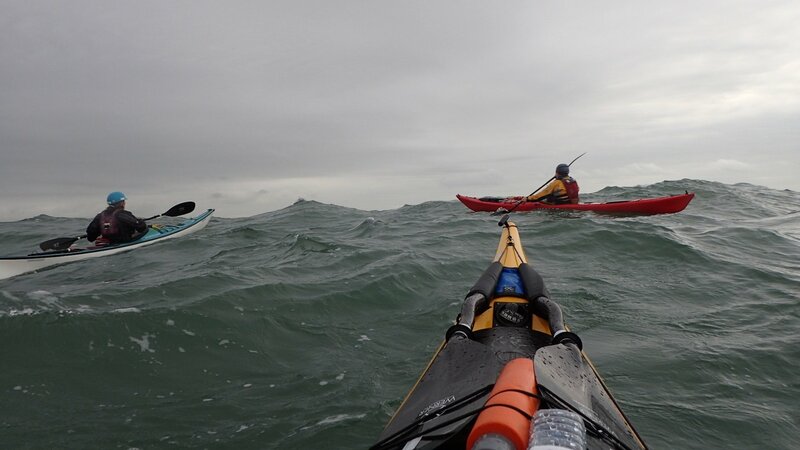 The Sea state in places was lumpy like yesterday, but this was easing off throughout the day. 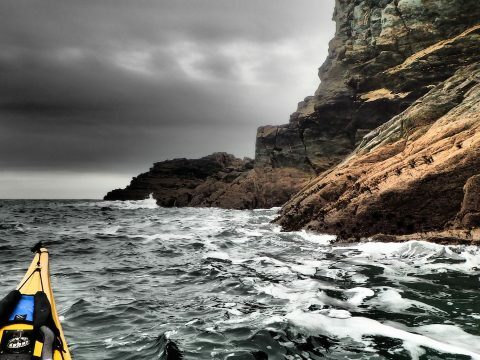 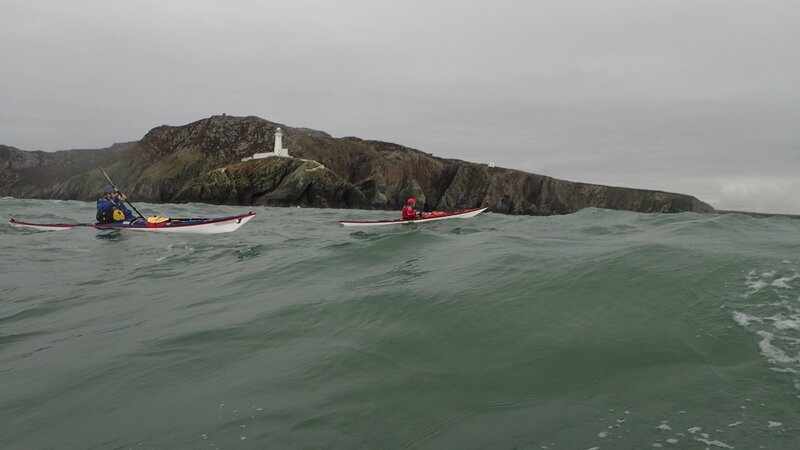 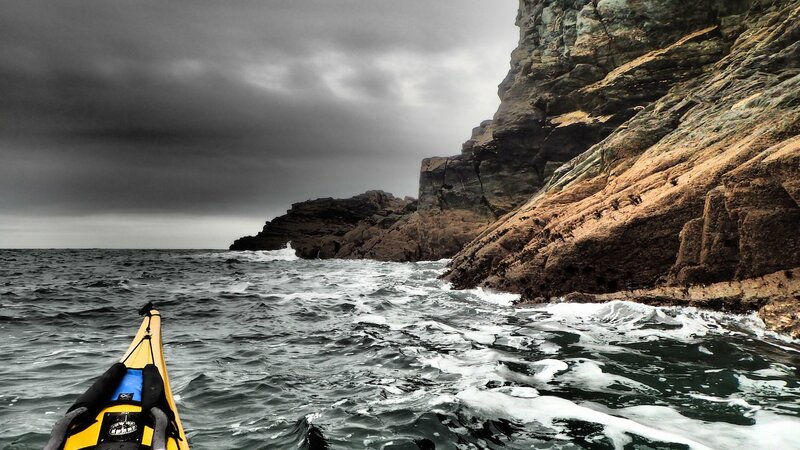 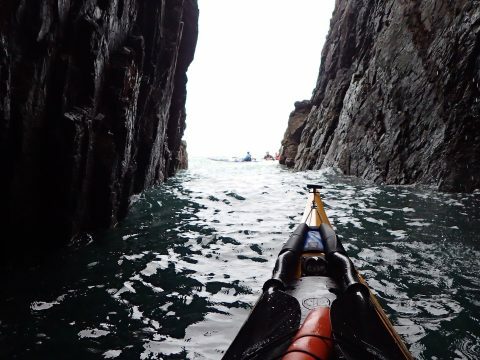 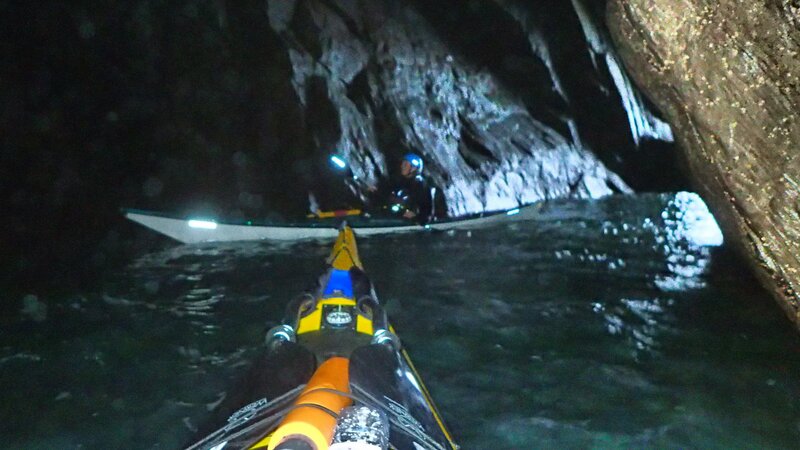 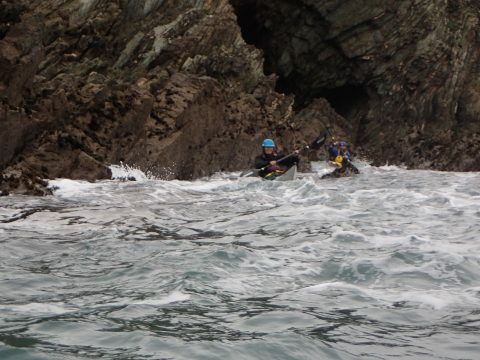 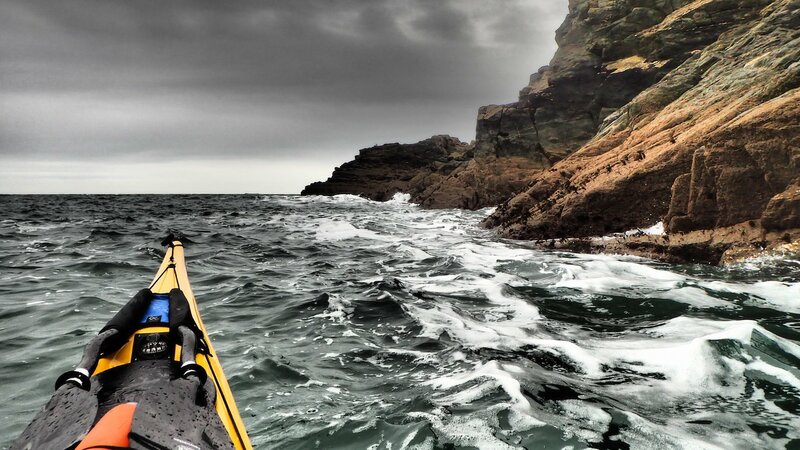 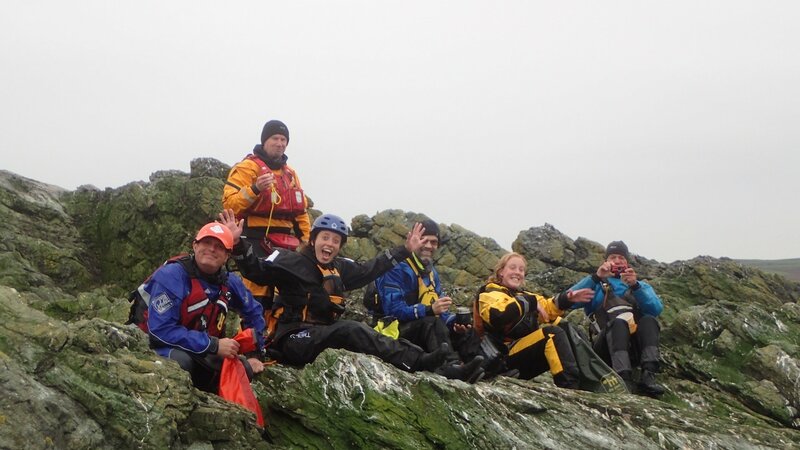 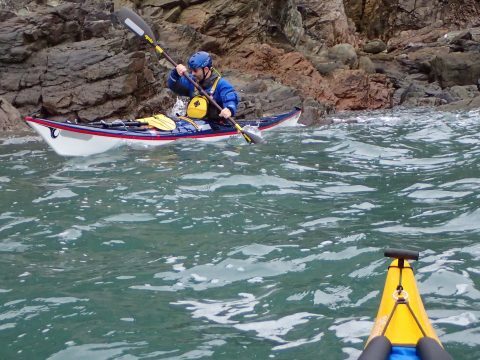 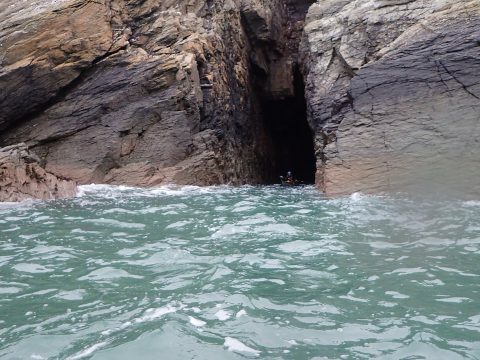 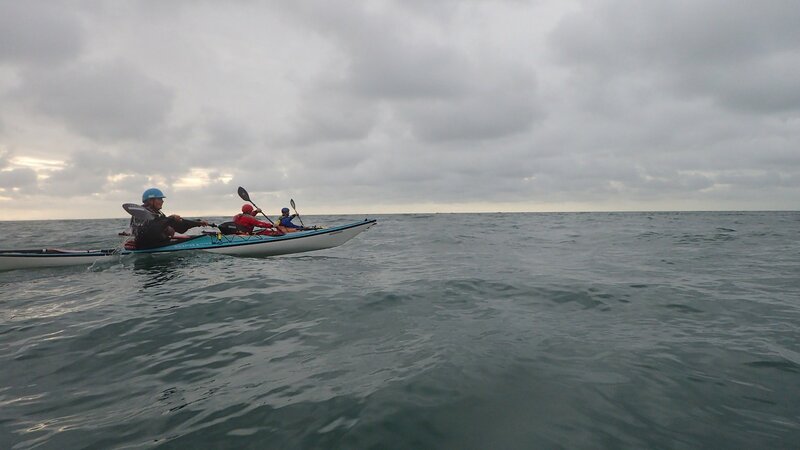 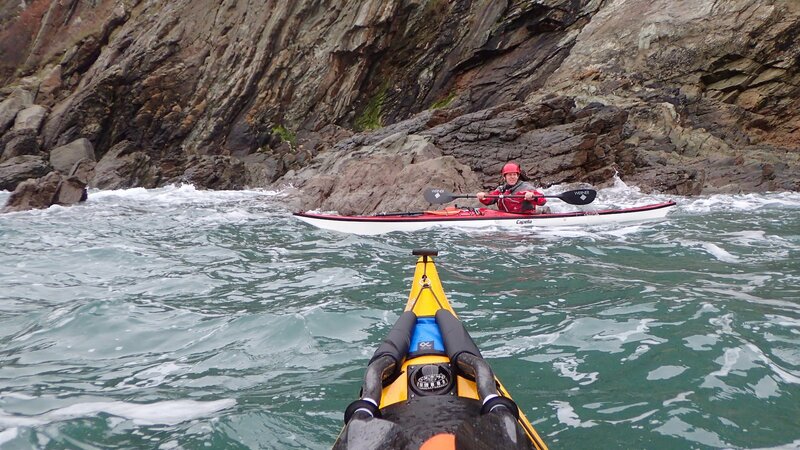 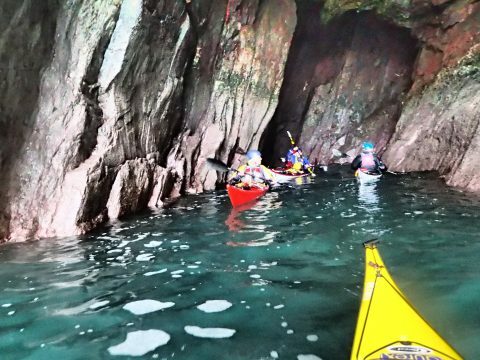 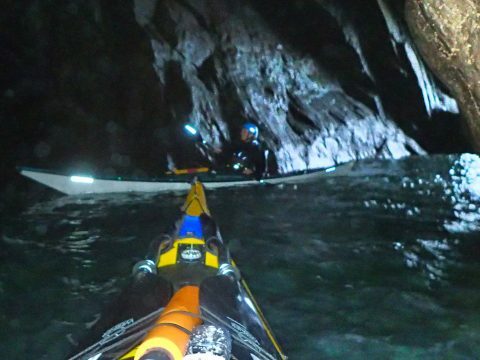 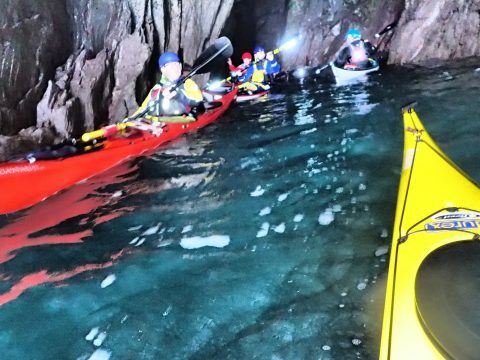 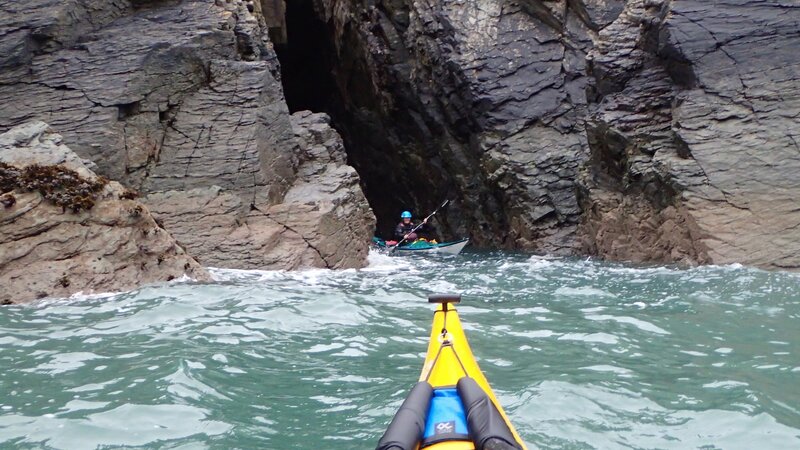 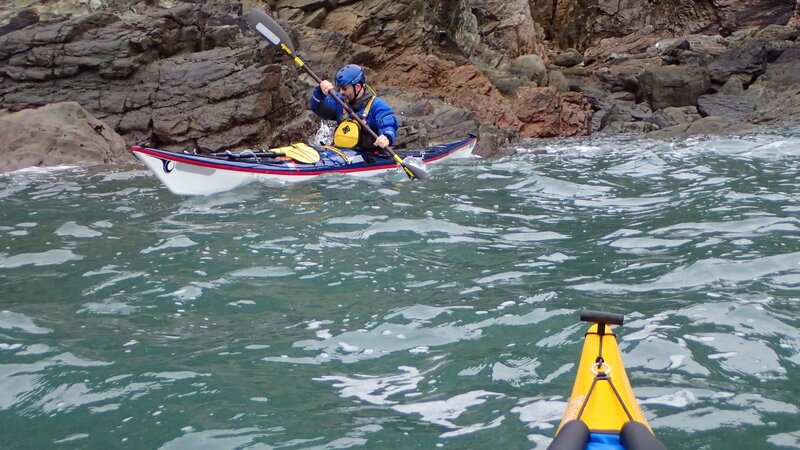 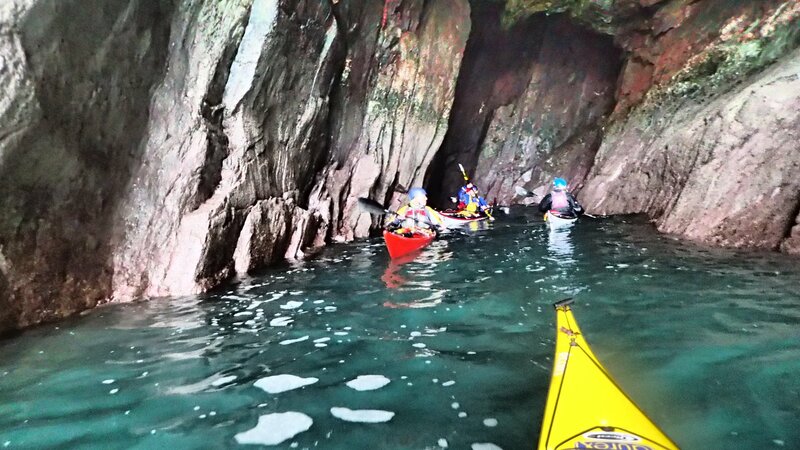 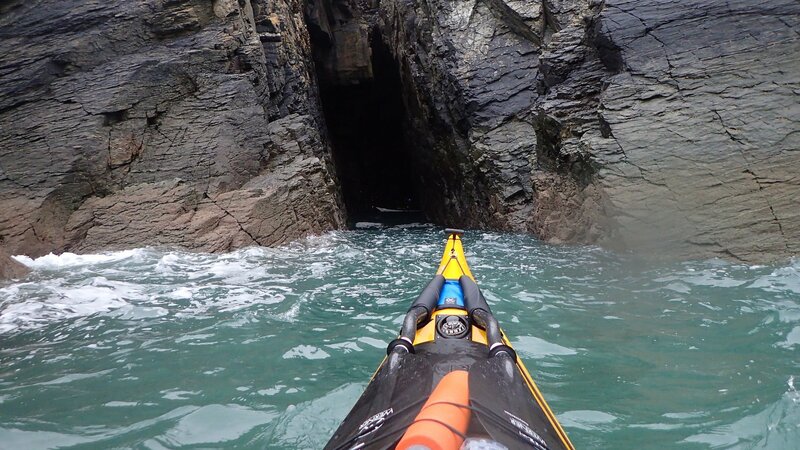 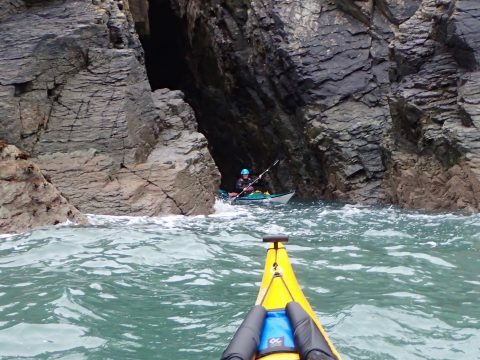 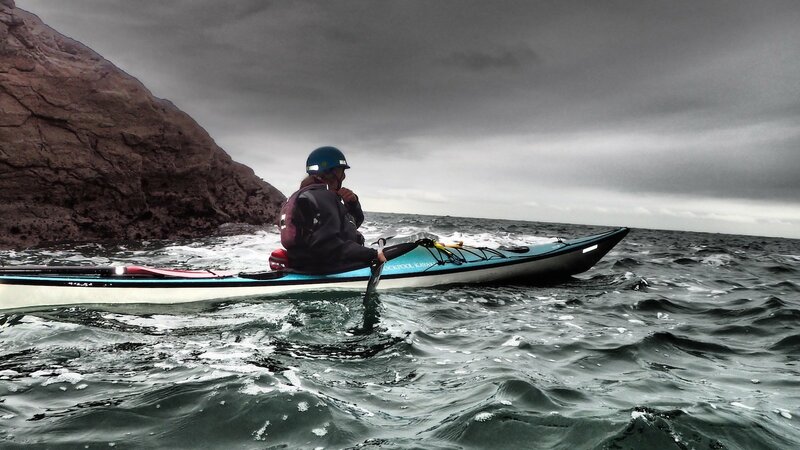 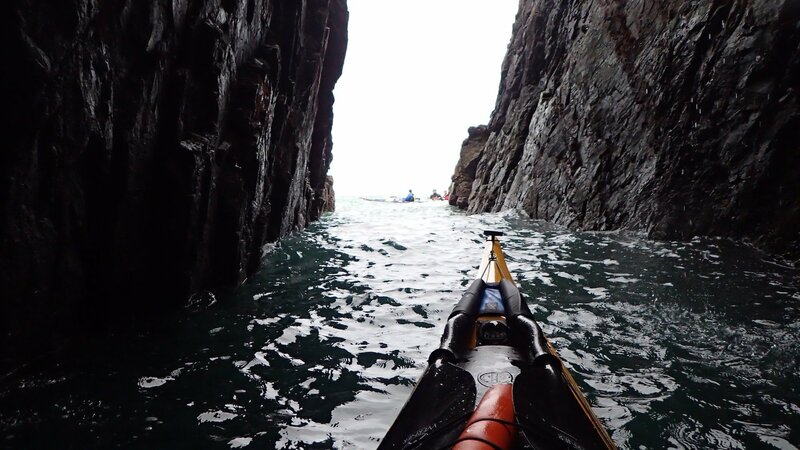 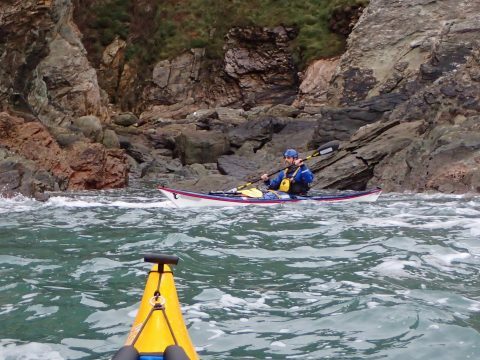 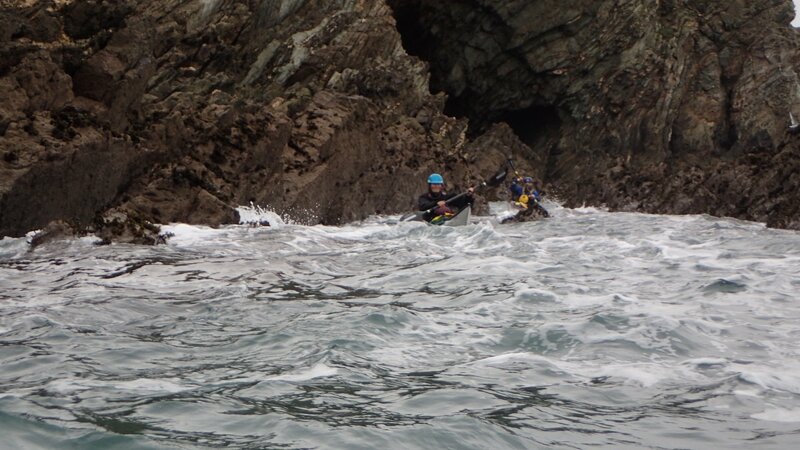 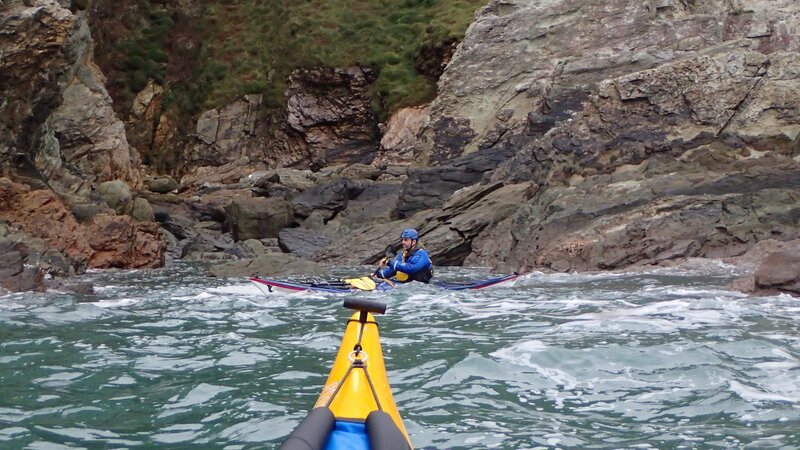 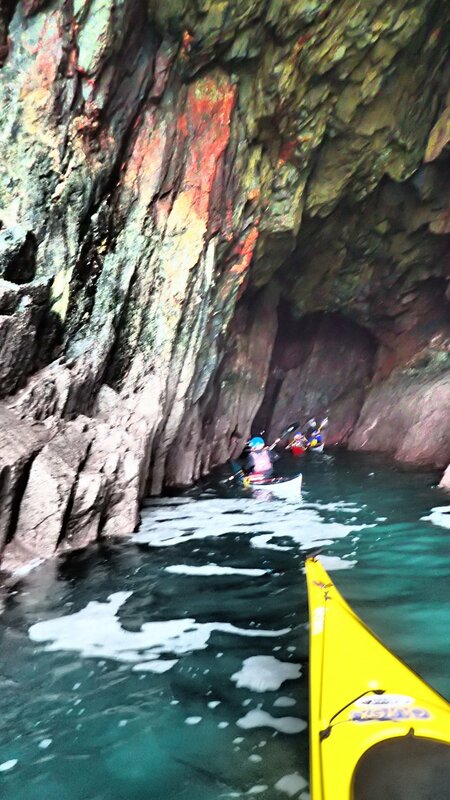 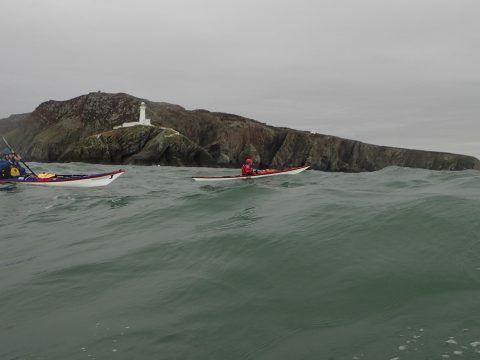 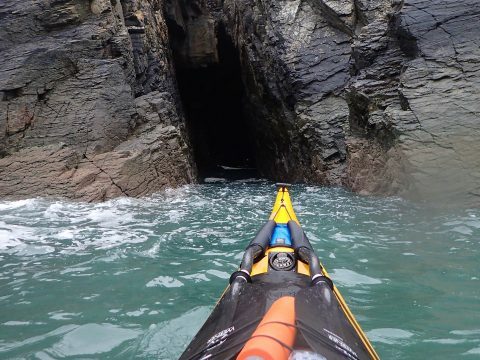 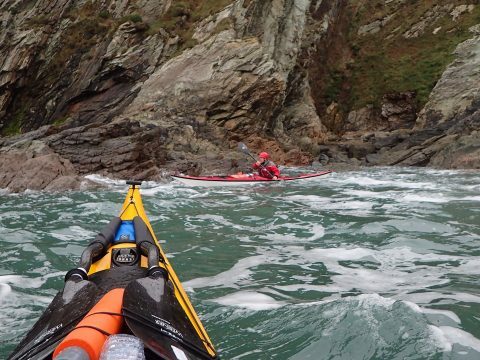 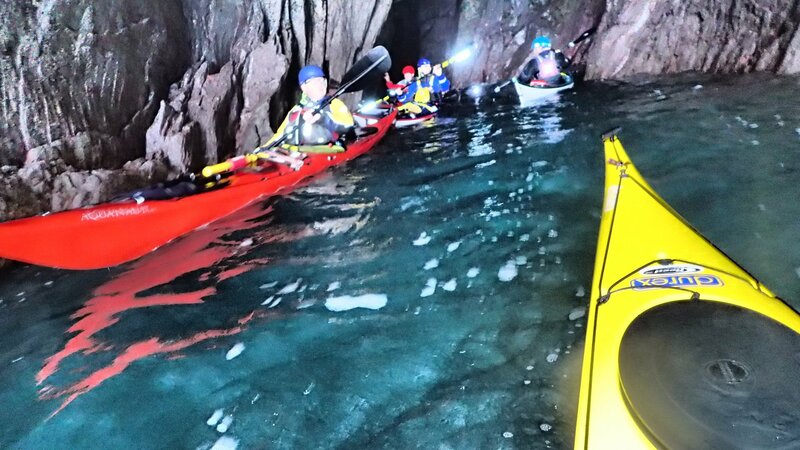 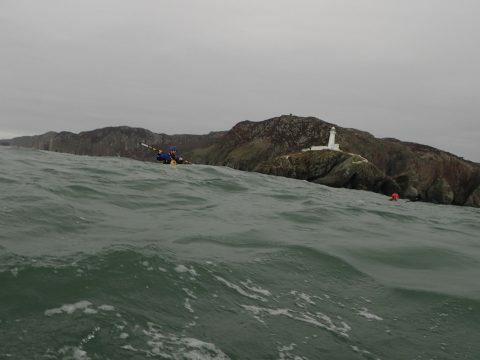 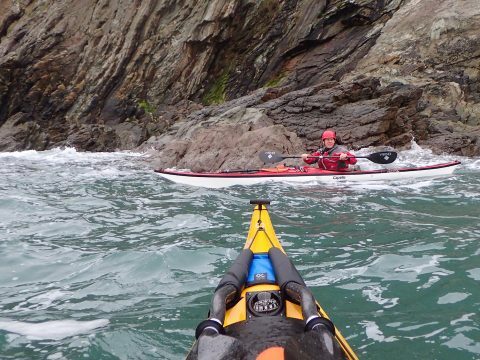 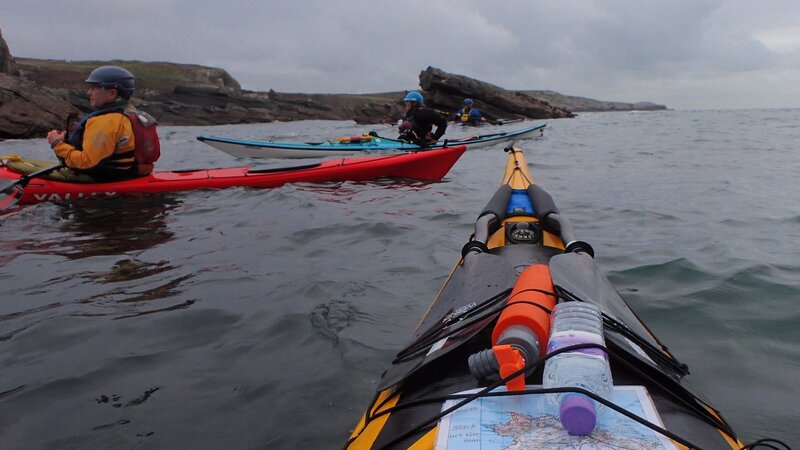 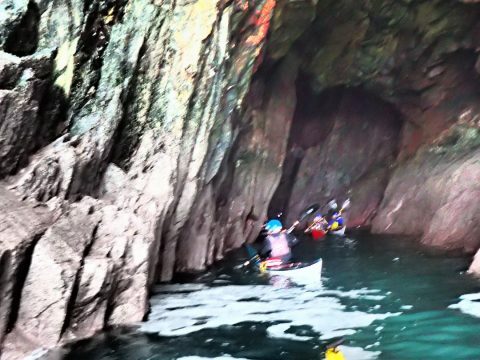 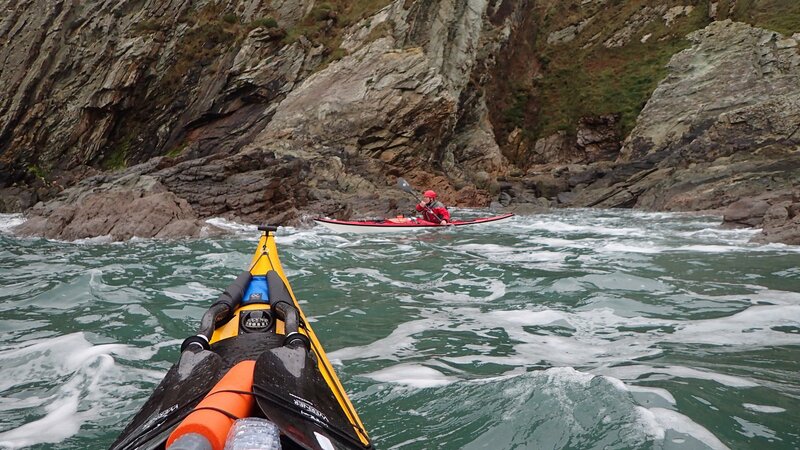 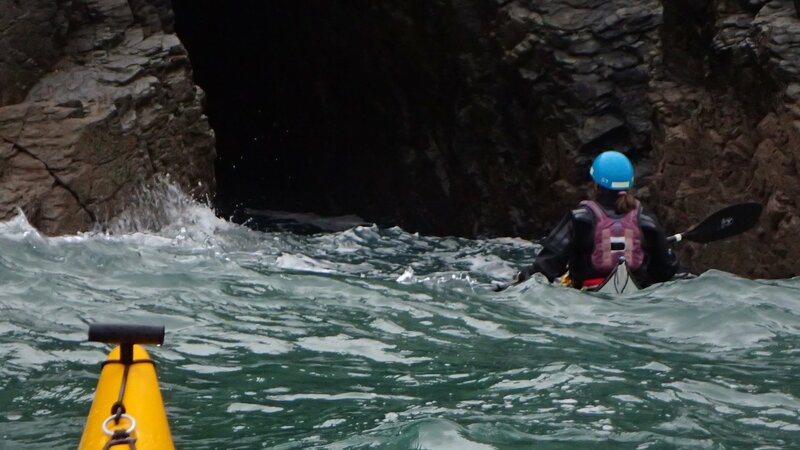 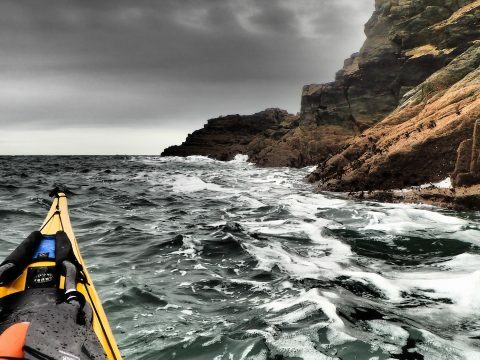 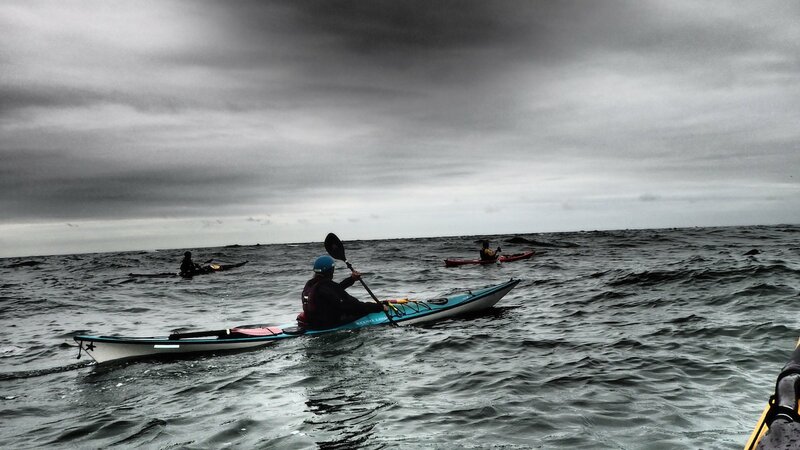 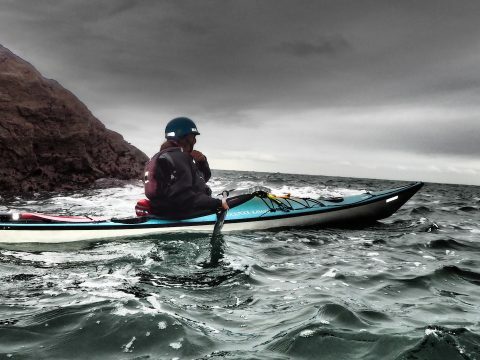 We managed a quick play on South Stack, before using the South Stack tidal race to take us back to Penrhyn Mawr. 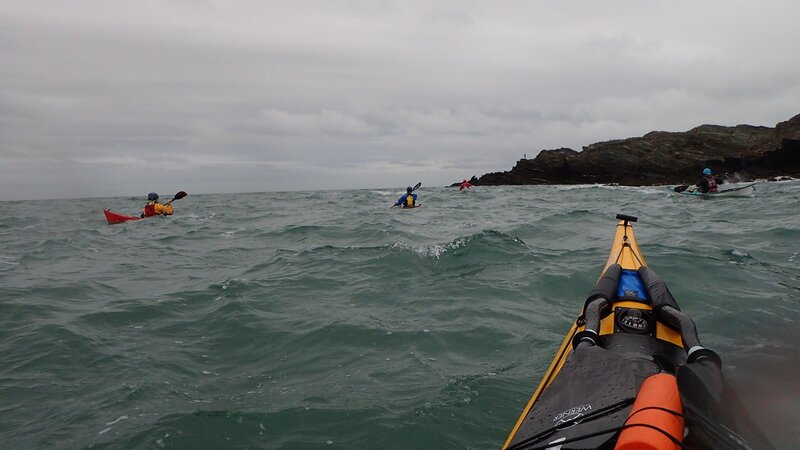 Despite the weather forecast it was a cloudy dull day, with light winds. 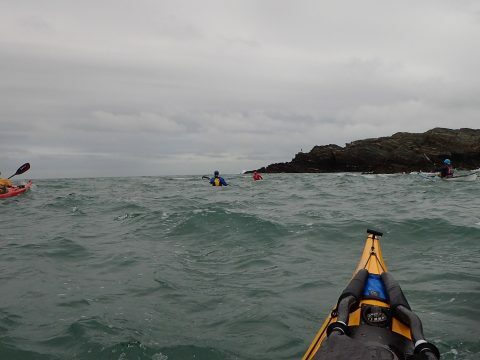 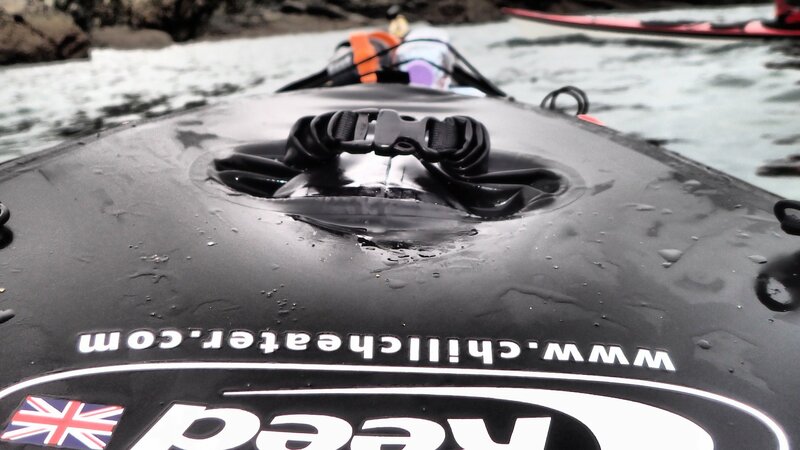 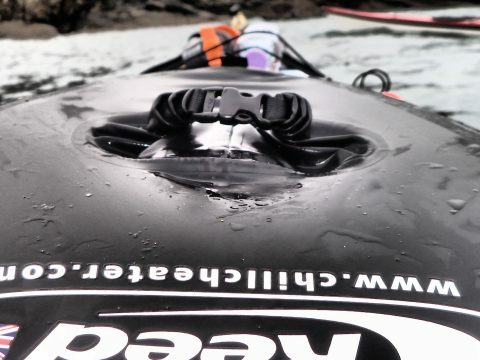 A brilliant enjoyable paddle. 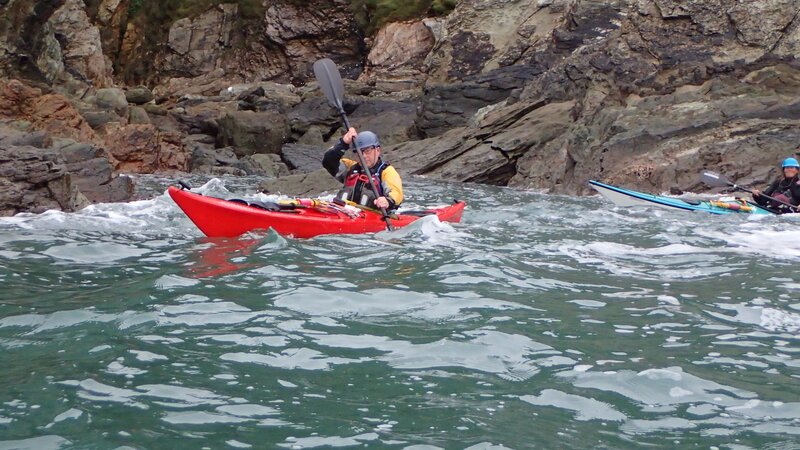 I was feeling on top form and grinning all the way home! 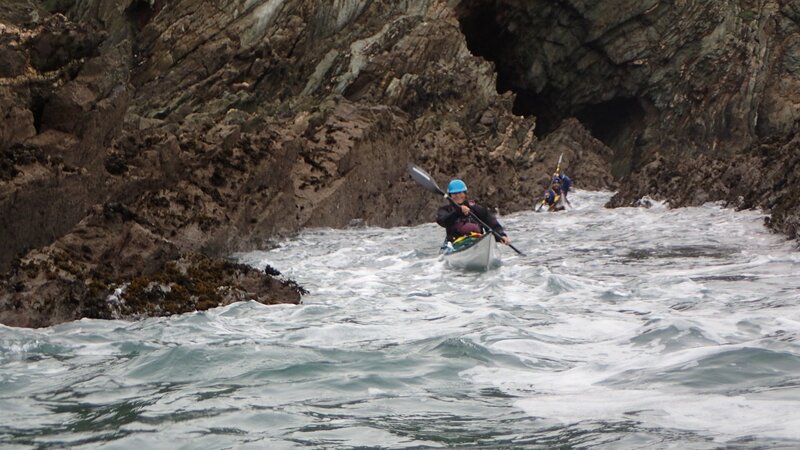 Thanks to Sue for leading the trip. 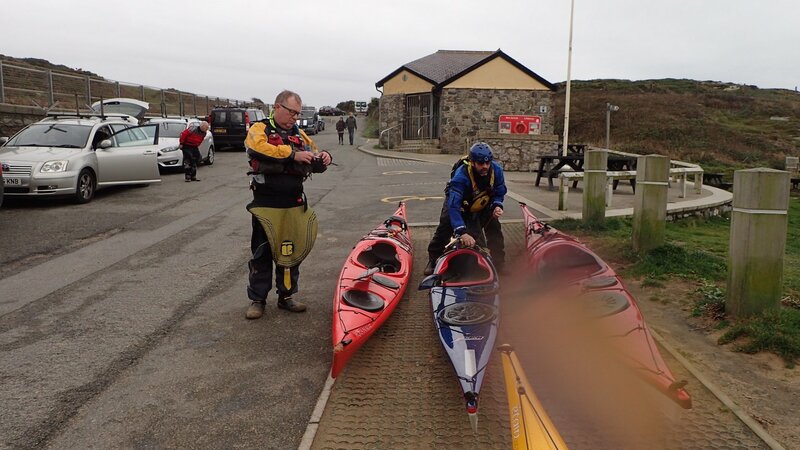 Sabina for organising the weekend, Penny at Anglesey Outdoors for being so accommodating, Stan for the excellent evening meal and everyone else for making this a very enjoyable weekend. 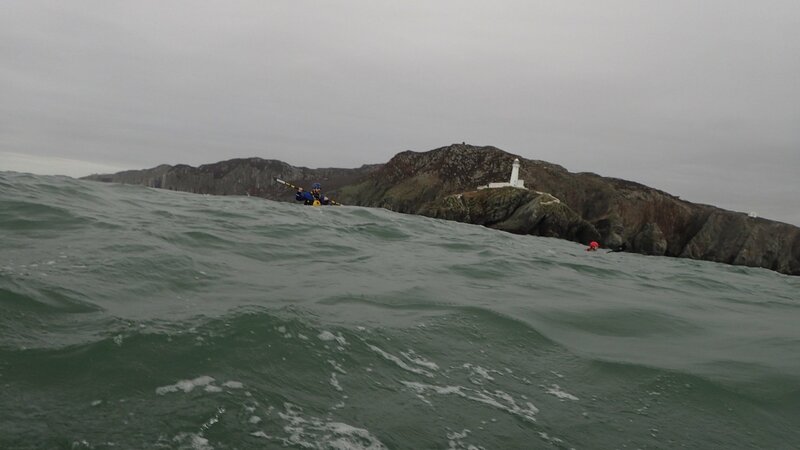 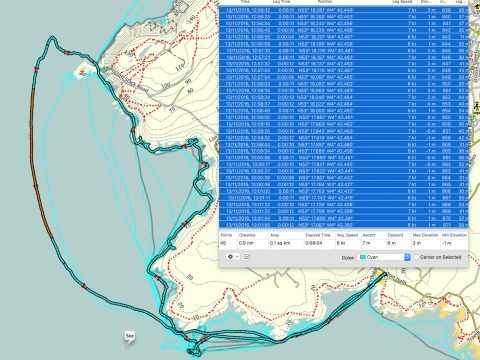 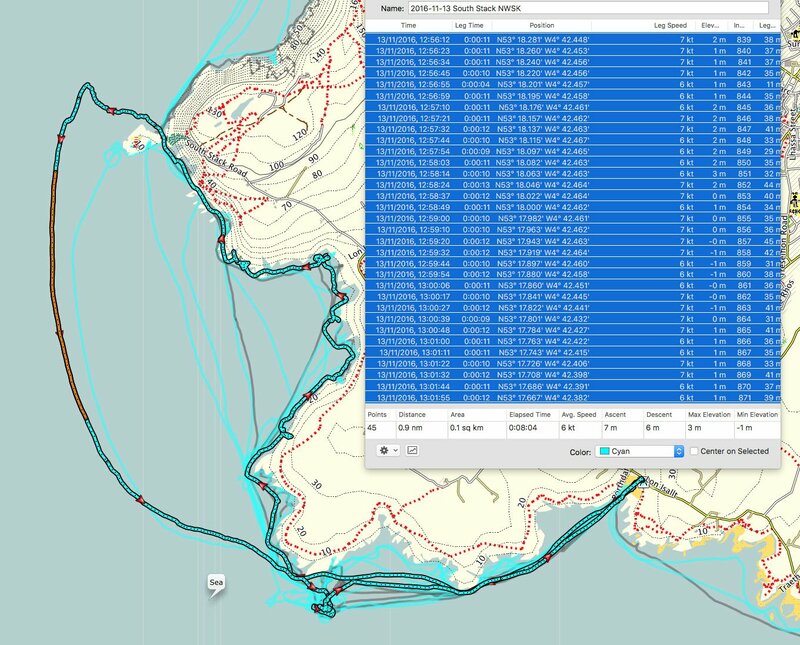 Our track: Nice speed coming back on the South Stack flow! 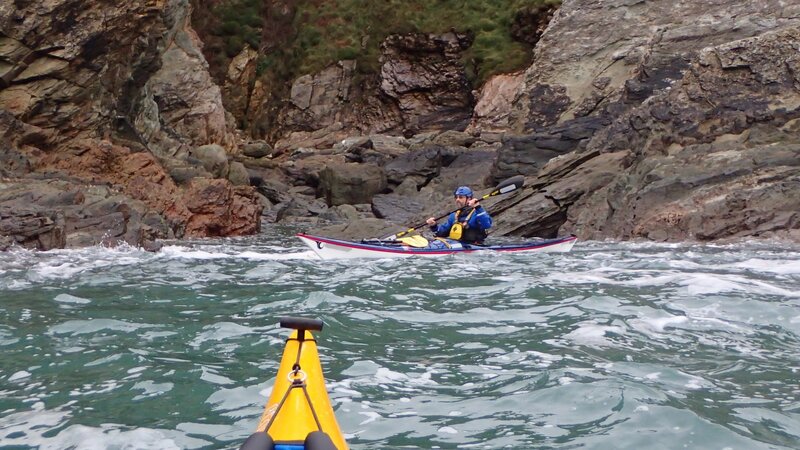 Camera duelling in South Stack. 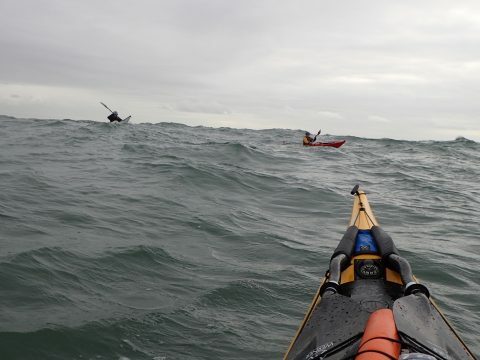 Who is going to stop first? 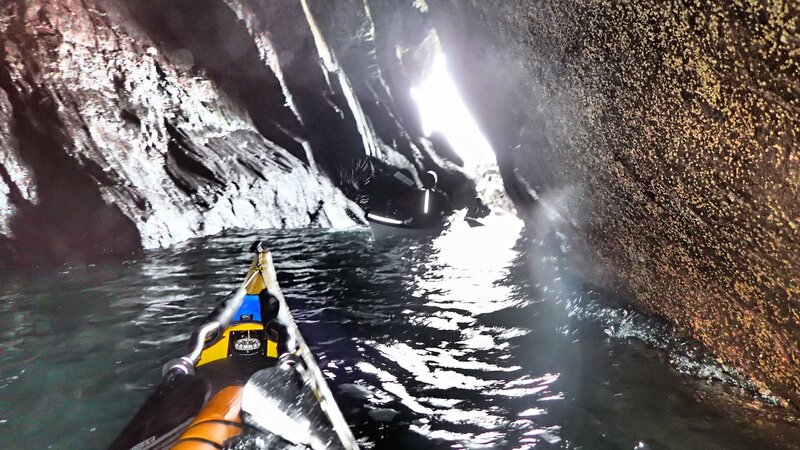 For the entrance to this cave is guarded by a creature so foul, so cruel, that no man yet has fought with it… and lived! 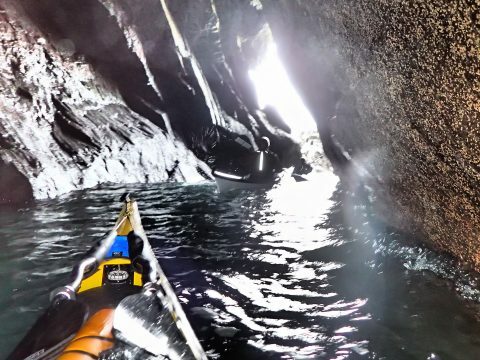 Behold the cave of Caerbannog! 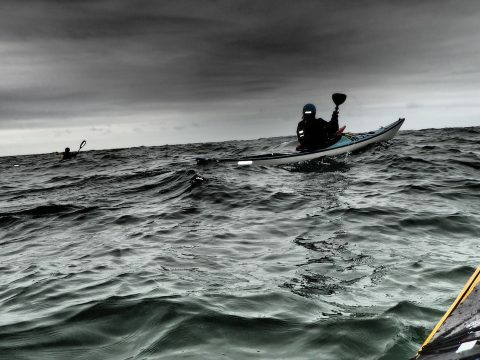 Bones of four fifty men lie strewn about its lair. 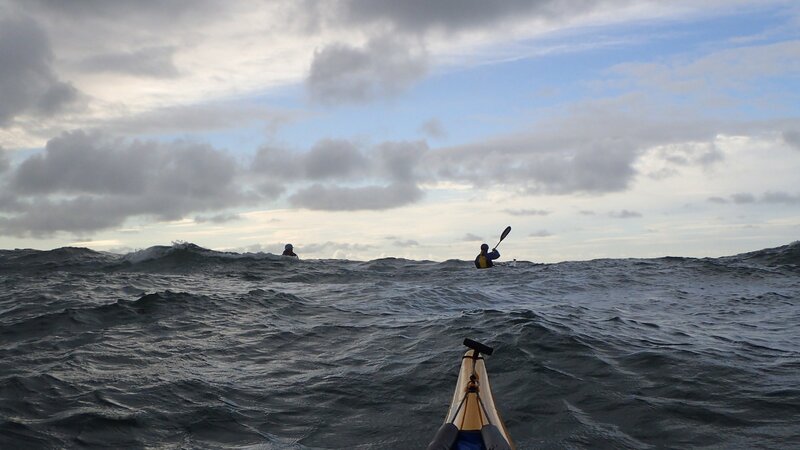 So, brave knights, if you do doubt your courage or your strength, come no further, for death awaits you all with nasty big pointy teeth.